August 14, 2013 | 7 a.m.
Virgil Olson served Bethel in a number of capacities during a long career at both the seminary and the college. 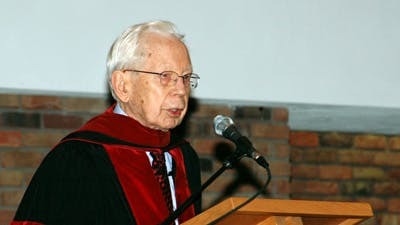 Virgil Olson died in June at the age of 96, and with his passing, Bethel University lost a great leader of deep faith and piety, an engaging professor of history, and a thorough and devoted chronicler of the history of the Baptist General Conference (BGC), now Converge Worldwide. Olson was born in 1916 in St. Paul, Minn., to Adolf and Esther (Larson) Olson. Pastors, missionaries, Bethel students, and faculty members were frequent guests in their home, and early on, Virgil’s life became intimately connected with what would eventually become the BGC, and later, Converge Worldwide. The only child of Adolf, who taught history and systematic theology at Bethel Seminary for several decades, Virgil helped write part of his father’s Centenary History of the Baptist General Conference, published in 1952, and co-wroteSeventy-five Years, a history of Bethel Theological Seminary, with his father. It marked the beginning of a long career of making history real and relevant. After graduating from Bethel Seminary just before World War II, Olson pastored churches in Michigan and Chicago before returning to the seminary in 1951 to teach church history, and later, missions. In 1968, he moved to Bethel College to serve as academic dean during the transition from St. Paul to the current campus in Arden Hills, Minn. He served five years as president of William Carey International University, Pasadena, Calif., founded to help missionaries continue their education from the field, and from 1974 to his retirement in 1981, he headed the BGC World Mission Board. During the course of his career, he visited more than 60 nations and was even inducted as an honorary member of the Adi tribe in Assam, India. Olson was honored as the Bethel College Alumnus of the Year in 1981 and the Bethel Seminary Alumnus of the Year in 1994. 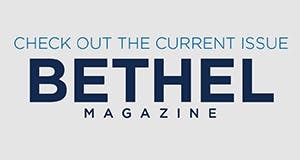 Read the full tribute to Virgil Olson in the summer 2013 issue of Bethel Magazine.